Beat Feuz, of Switzeland, gets low into the turna s he flies down The Brink during the Birds of Prey downhill race on Saturday, Dec. 2, in Beaver Creek. Feuz took second behind Norway's Aksel Lund Svindal. BEAVER CREEK — Norway’s Aksel Lund Svindal returned to the top of the downhill podium at the FIS Birds of Prey World Cup on Saturday, Dec. 2. 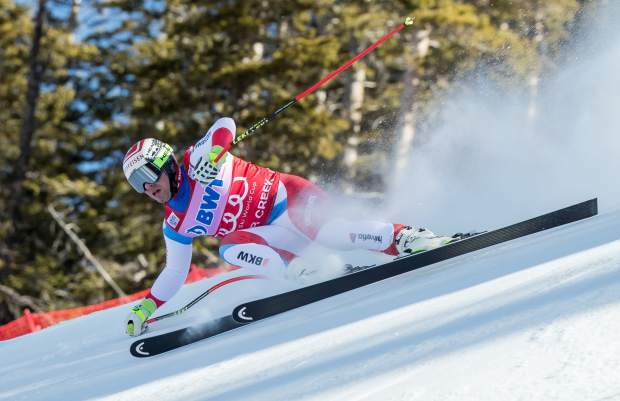 Swiss racer Beat Feuz was the second fastest on the day, and Germany’s Thomas Dressen finished in third. It was Svindal’s first World Cup win since Jan. 22, 2016, when he won the super-G in Kitzbuehel, Austria. A day later, he tore a ligament in his knee which sidelined him for the remainder of the season. “It was nice to feel the excitement of being the leader once again,” Svindal said Saturday following the win. Askel Lund Svindal gives a press conference following his victory in the downhill at the 2017 FIS Birds of Prey World Cup in Beaver Creek. Leading up to the race, Svindal was given the choice between starting first and starting 11th or higher; he chose first to ski the fresh course and finished in 1:40.46. 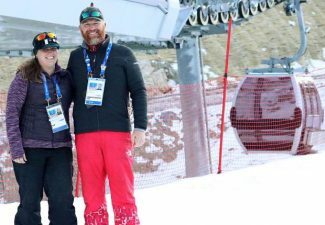 “I figured start number one, there was no real disadvantage to it,” Svindal said. “The only disadvantage is you don’t get a course report. 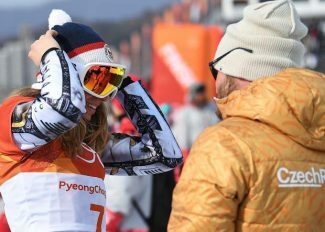 For a racer who knows the course as well as Svindal, a course report may not have helped much anyway, something he acknowledged following the race. The win was Svindal’s sixth at Beaver Creek, tying him for the most ever wins on the Birds of Prey track alongside American Ted Ligety. “Ever since I came here for the first time, I think it’s one of my favorite stops on the World Cup tour,” Svindal said. The Birds of Prey course has been a source of pain for Svindal, however, as well. 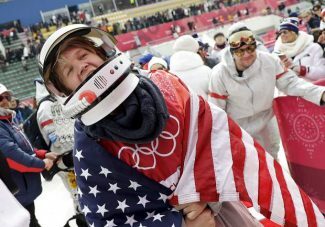 In 2007, he suffered the first major injury of his career here, getting off balance on the Golden Eagle jump during a training run and landing hard on his lower back. He reflected on the incident following his win on Saturday. Svindal said he feels lucky that he was able to make it to the World Cup and win races without major injuries when he was young, because it availed him to more resources when he did start having trouble. Downhill racers are given their start positions based on their ranking. Svindal said his first choice would have been starting position number three, but it was not available when it came time for him to choose as that position was already claimed by Beat Fuez, who went on to finish second with a time of 1:40.61. On a course like Birds of Prey, the flat sections tend to get faster as they are skied more, something Svindal pointed out after the run. However, with the abundant sunshine and warm temperatures the course was seeing on Saturday, the course was also more susceptible to grooves and bumps as the day wore on. 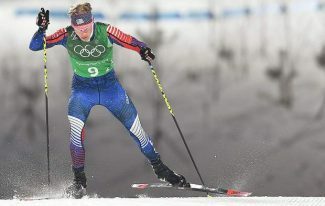 While the two fastest times were posted by the racers in the front of the pack, that trend was contradicted by the skiers who finished in third and fourth. Dressen came from 10th position to finish in third, and fourth-place finisher Christof Innerhofer started in 27th position. Dressen said watching Innerhofer’s run was a nerve-racking experience. 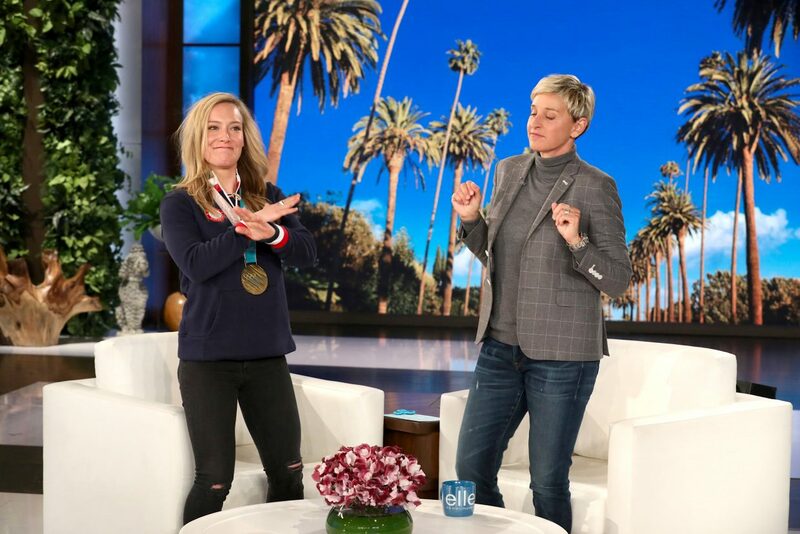 Dressen’s nervousness was compounded by the fact that a member of the German men’s ski racing team has not earned a podium in the downhill since 2004, when Max Rauffer won in Val Gardena, Italy.